President Trump was on the verge of “decertifying” the Iran nuclear deal this week and handing the fate of the agreement to Congress. The administration is required by law to certify every 90 days that Tehran is complying with the 2015 accord, under which the country limited its nuclear program in exchange for sanctions relief. Failure to certify triggers a 60-day period for Congress to decide whether to reimpose sanctions on Iran— an act that would essentially scuttle the deal entirely. Trump administration officials hope the prospect of the accord’s collapse will force Iran and the other signatories—China, France, Russia, Germany, the U.K., and the EU—to renegotiate terms. The International Atomic Energy Agency’s inspectors say Tehran is complying with its agreement not to develop nuclear capabilities. But Trump, who has criticized the accord signed by President Obama as “the worst deal ever,” said last week that Iran’s expanded ballistic missile program and belligerence in the Middle East runs against the “spirit” of the deal. This is President Trump’s “most feckless foreign policy decision yet,” said The New York Times. Iran “is a bad actor,” but the deal is “working”—it is stopping Tehran from producing a nuclear weapon. While Congress is unlikely to kill the accord this time—many previously critical Republicans “now see its value”—there are no guarantees what it will do in the future. Decertification will also further “alienate” our European allies, “give Iran an excuse to resume a full-blown nuclear program,” and make other nations less likely to negotiate with us in the future. Besides, Trump is already involved in one dangerous nuclear standoff, with North Korea. Why risk another? I was a vocal opponent of the 2015 accord, said Max Boot in ForeignPolicy.com, but decertification is a huge mistake. It will “isolate not Iran but the U.S.” The mullahs will never renegotiate a deal that’s good for them as it is. If the U.S. abandons this agreement, it would take Iran only “about a year” to produce nuclear warheads, said Joe Sestak in The Philadelphia Inquirer. 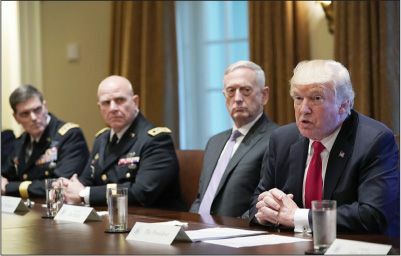 The only way to stop them would be a campaign of heavy bombing—but that would trigger a sustained counterattack from Iran that would close oil-shipping routes in the Strait of Hormuz, destabilize the global economy, and result in missile attacks on Israel and U.S. military bases in the region. In other words, a major regional war.